Articulation: Swivel/hinge ankles, double hinged knees, swivel thighs, balljointed hips, balljointed mid-torso, swivel/hinge shoulders, swivel/hinge elbows, swivel/hinge wrists, balljointed neck, and a balljointed head. Accessories: Officer's cap, helmet, chest armor, and blaster pistol. * At first glance you might think that General Veers (left) is a simple head swap of Grand Moff Tarkin (right) but guess what? You'd be wrong! While the legs, arms, and lower torsos are the same, the upper torsos and hands are completely different. Technically General Veers should be a bit taller than Grand Moff Tarkin but I can let that slide here since Hasbro is able to get a little more reuse out of these molds that way. Otherwise, it is doubtful we'd get characters like Veers or Piett in this line. * General Veers look fantastic! They might be terrible people but no one can say that the Imperials aren't snappy dressers. I like the bleak grey military styled outfit with the appropriate rank board and only a single code cylinder on his left breast. Veers is also wearing gloves, which sets him apart from the other Imperials officers in a nice way. The paint work is sharp and looks great all around, too. * The headsculpt is excellent and the new faceprinting makes this figure really look like Julian Glover. The detail on the eyes and facial features is unreal. If this figure were released in the smaller 1/18th scale I definitely would try to turn one of these into Walter Donovan since Hasbro's Indiana Jones line never released him. * The look is really complete when you give Maximillian Veers his officer's cap. It's brilliantly sculpted and fits on his head very well. The fit is perfect and if you didn't know better you might think this was all one sculpt when looking at him. 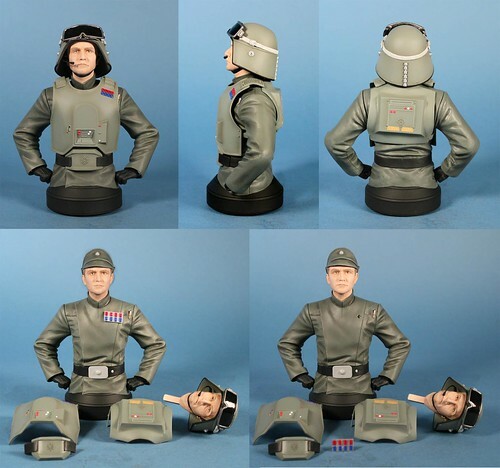 * One of the coolest parts of this figure, though, is that we get both of General Veers' onscreen looks. Because he is a decisive and bold man of action, Veers suits up and heads down to Hoth himself to lead the Imperial assault on Echo Base. There have always been complaints with Black Series collectors that Hasbro cut down on the accessories offered with each figure after the first series or two, but Veers feels like a well thought out and highly definitive version of the character. The armor fits over his torso while the helmet slips over his head to create a very impressive and authentic second look for the character. Hasbro isn't the first company to do something like this, but it is impressive for the Black Series line. * The helmet fits like a charm and looks excellent. There are lots of paint applications on this and the detail is spot on. This also really makes me want an AT-ST Driver in the Black Series. * The back armor also has quite a but of detail and painted features, too. Yeah, there are a couple of missing paint hits here but overall this is some solid work. I'm loving it. * OK, what is this blaster and where does it come from? It appears to be a DL-21 blaster pistol without the fancy muzzle. It looks great but I'm wondering where Hasbro got this design? I can't find it. All of the images of Veers have his holster left empty while the 501st databanks don't list this pistol as an accompanying item to the costume (just a DH-17, E-11, or DL-44). If you know where this design came from please let me know! * The articulation is excellent. While Veers mostly just stands around or chills out in the cockpit of an AT-AT, it's nice to know he can join the action if he needs to. He's sturdy and well made so have fun and go crazy with him. * Since the armor is all one piece, it did suffer a bit from being stuffed into the packaging. You may have to work with it or even use a hairdryer to reshape it to fit down over Veer's chest properly. * The modified DL-21 really doesn't fit well in this holster. Looking at it, the holster doesn't really even appear to be designed for the DL-21, so I wonder why Hasbro went with that model? I'm always up for getting new blasters, though, and you can get it to fit OK, but it looks a bit off at a very close inspection. General Veers is definitely the best Walgreens exclusive Star Wars figure yet released. Not only is he a completely new character (Boba Fett, Darth Vader, and Obi-Wan Kenobi were all repaints or variants of previously released characters) but he's really well accessorized with lots of new parts. The armor takes some futzing around with but it eventually should look pretty good. I'm always glad to add another Original Trilogy figure, especially from The Empire Strikes Back, and Veers is a Great and a 1/2 edition. Thanks Walgreens for continuing to be so awesome in getting your exclusives out! That is indeed a DL-21. It's seen used by the officers in the shield generator bunker on Endor, Colonel Dyer ("Freeze!") and Lieutenant Renz ("You Rebel scum!") in particular, both without the muzzle extension thing. I guess Hasbro figured this was the standard Imperial officer sidearm (Piett also comes with it). My issues with this figure are twofold. First, the reuse of Tarkin parts, the legs in particular, mean he's too short. Veers was very tall, almost as tall as Vader. Then there's his hair color. At the time of filming, Julian Glover had brown (or at least salt and pepper) hair, not the solid gray hair he'd have later on in Indiana Jones and the Last Crusade. OK< very cool. I'm going to have to check that out. I could find nothing about that on Wookiepedia or the 501st site. Yeah, I mentioned that he definitely is a bit short (and Tarkin is probably a bit too tall). There definitely is a seen where Vader almost looks Veers in the eyes. About the hair, I looked and looked for pictures where you could really see him without any hat or helmet and couldn't find one. I do think Hasbro went with hair closer to his later appearances, maybe to make him more recognizable? Yeah, I can see that. It's just really tough to tell! I do think they probably went too light, though. Oh well.. he does always wear the hat or helmet, so it's less of an issue than, say, the TFA Han Solo's hair. If I remember my pre-Disney Star Wars stories correctly, I think then-Colonel Veers never told any of his superiors about the AT-AT's vulnerability to being tripped by reinforced durasteel cables wound around the walker's legs. I don't remember that at all. I know he was severely crippled and could not be healed using Bacta and such, so he had to use a hoverchair. I believe he also was demoted to Captain at some point and died during Dark Empire II. Colonel Veers removed the recruit who found out about the AT-AT's weakness from walker operator training and sent him to the stormtrooper units. To be fair, if I were in Veers' boots and Darth Vader was already around at the time a trainee discovered a potentially huge flaw in one of the Empire's major weapons systems, I'd make sure nobody else would ever learn about it too. Getting choked from long distance wouldn't help my career at all. I do wonder why they didn't do that. I presume it is because Thrawn has epaulets and very differently placed code cylinders. Still, something give some added height would have been welcome. Longer legs, perhaps? I assume Hasbro is augmenting the digital sculpt or tweaking elements of molds or something. There's gotta be some reuse involved for us to keep getting Imperial officers at the rate we are getting them. This version of the pistol seems over-sized to me. Compare it to Dengar's (which has the extra muzzle piece). Could be why it doesn't fit the holster all that well.